for years, scientists have implicated respiratory problems with pollution particles less that 10 microns in diameter, but to what extent they affect the respiratory system was not known. Now, a study proves that these particulate matters penetrate very deep into the lungs of even healthy children. The study was conducted by researchers of the Leicester Children's Institute for Lung Health, University of Leicester, the uk. H J Bunn, D Dinsdale, T Smith and J Grigg, the researchers, studied the size and composition of particles within the lungs of people not suffering from any respiratory disease. "We wanted to know for certain whether these particles are really able to enter the lung and cells, thereby, causing respiratory diseases," says Grigg. For this purpose, they scrutinised alveolar macrophages (am) -- lung cells that eat up all foreign particles such as particulate matter present in vehicular emissions. This makes them a reservoir of all inhaled pollutants. Fifty-one children undergoing surgery but not suffering from any kind of respiratory problems were chosen for the study. "We chose the normal children since they are well defined. We need to know normality before looking at the abnormality," says Grigg. The samples of the children's bronchoalveolar lavage (bl), the fluid consisting of am, were analysed. The samples of bl were rejected if they had insufficient number of macrophages or if they were infected by bacteria. After this short listing, a total of 22 children between the age of three months to 16 years were selected for the analysis, which basically aimed at studying the percentage of macrophages having pollution particles and the size of these particles. Along with this, data about the area where each child lived was also collected and scrutinised. 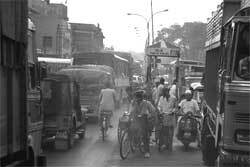 The children were divided into two groups on the basis of whether they lived in traffic-intensive areas or resided in places that had little vehicular movement. According to the researchers, these findings are evidence enough for the hypothesis that very small pollutant particles penetrate very deep into the airways of children. Researchers believe that the findings show that if carbonaceous particles are deposited in the respiratory system of normal people, then this must be the case for children suffering from respiratory diseases. But the study could be prone to some errors, as the scientists were unable to remove the chances that the children had actually inhaled bigger particles, which were subsequently ingested by the macrophages. The absence of metal in the samples was also surprising, as it is an identifying feature of vehicular pollution. The metals could have been leached out of the carbonaceous particles when they were injested in the macrophages or when bl was being prepared for analysis.